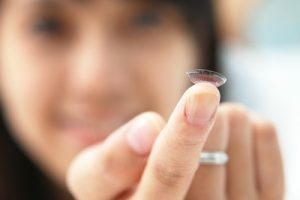 Summary: Putting in contacts for the first time is a learning experience that’s easier than you might think. Putting in contact lenses for the first time shouldn’t be daunting and terrifying. And after some practice, it really isn’t. You may find it difficult to put in your lenses at first, and they may initially feel uncomfortable in your eyes. But, like everything, applying your contact lens comes with a ton of practice, and your eyes will need to adjust to having lenses in them. Most of the time, you’ll get your contacts in the right way, but some soft lenses require you to flip them inside out when they maneuver around in the case. Be sure you wash your hands prior to handling them and take a close look at the shape. You want it to look like a half-circle as opposed to a slight U-shaped figure. If anything, once you put them in, you should feel some discomfort which is an indicator that the lens should be flipped to the other side. Before you put in your contact lenses, it’s important not to overthink the process. Assuming that you’re going to poke your eye or cause damage won’t help your cause. Many people automatically assume that they’re going to injure themselves but chances are they won’t. It may take a bit of practice but having a steady hand and some patience will make the process that much more seamless. Lens.com recommends that you practice putting them in and taking them out properly before rushing the process.